Well I can’t think of anything fun to make a console war about, so I guess it is finally time to end my Console War series. Today I will be simply adding up all the place numbers for each console throughout every one of my posts in the series. Then I will rank them from highest number to lowest number, the lowest number meaning the best ranked sum. So like golf basically. This is no game, this will really see what is the greatest console of all time, as far as being ranked by abstract things are concerned anyway. I will be writing a number after each console name. This number reflects its total score from all the other wars I’ve done.Well here they are, the 22 biggest consoles ever made, in ranking order from worst to best. 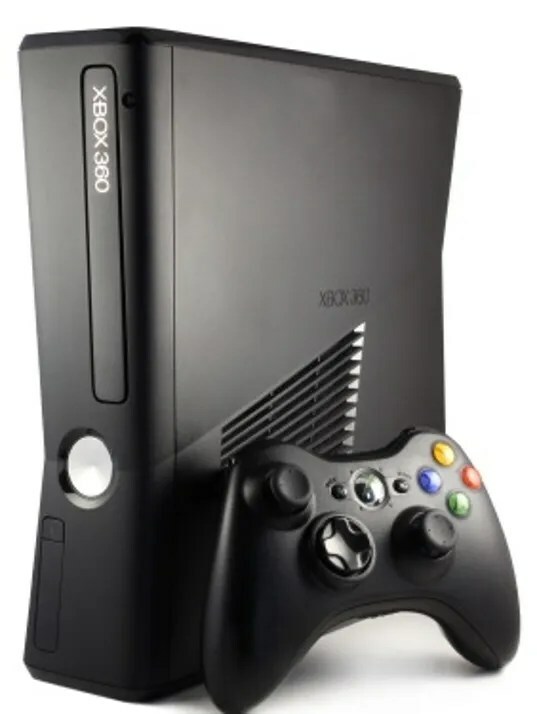 This is the worst console ever, but only out of the best 22, so that’s at least one good thing to say about it. It’s name was ranked 19th, controller 21st, appearance 21st, game 21st, and price 12th. The oldest console on the list. It’s name ranked 15th, controller 19th, appearance 22nd, game 19th, and price 8th. Rough time for Atari, though it’s age and the market of video games during that age make these consoles really not stand a chance compared to today. It’s name ranked 21st, controller 20th, appearance 18th, game 20th and price 1st. Let’s hear it for the lowest priced console! That is something this one should be proud of! 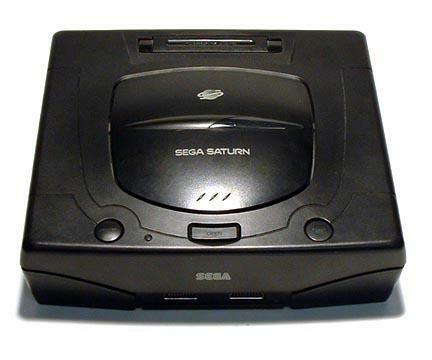 Widely considered Sega’s biggest failure. It’s name ranked 8th, controller 13th, appearance 10th, game 18th and price 20th. 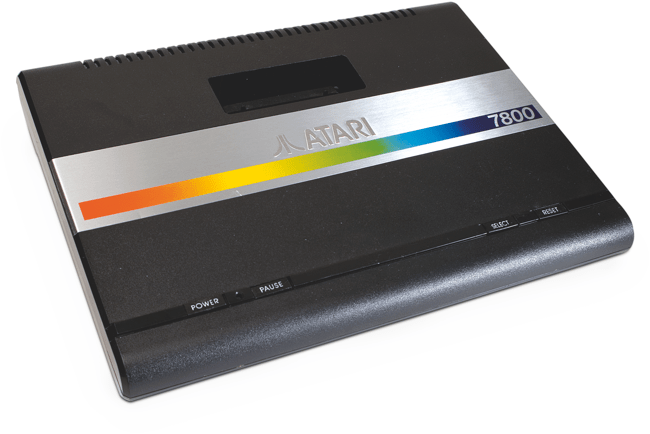 Atari’s last console and highest ranked console. It’s name ranked 9th, controller 22nd, appearance 11th, game 13th and price 11th. 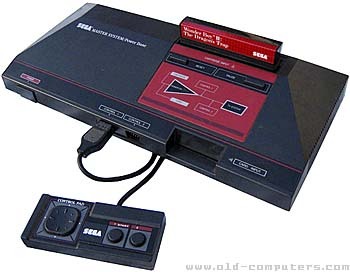 Sega’s first console. It’s named ranked 7th, controller 17th, appearance 16th, game 14th and price 9th. Microsoft’s latest console is the first to appear on this list, just one point ahead of the SMS. It’s name is ranked 16th, controller 7th, appearance 3rd, game 15th, and price 21st. 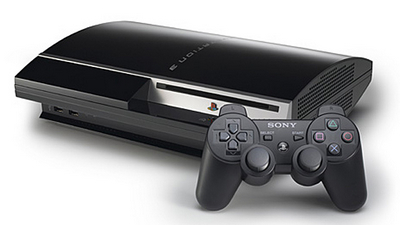 Sony’s first console is the first to appear on the list, just one point ahead of the XB1. Close competition! It’s name ranked 1st, controller 15th, appearance 20th, game 9th, and price 16th. The next two consoles are tied. I will instead choose their rankings by how many top 10 appearances they’ve had, the one with more getting a better spot on this list obviously. 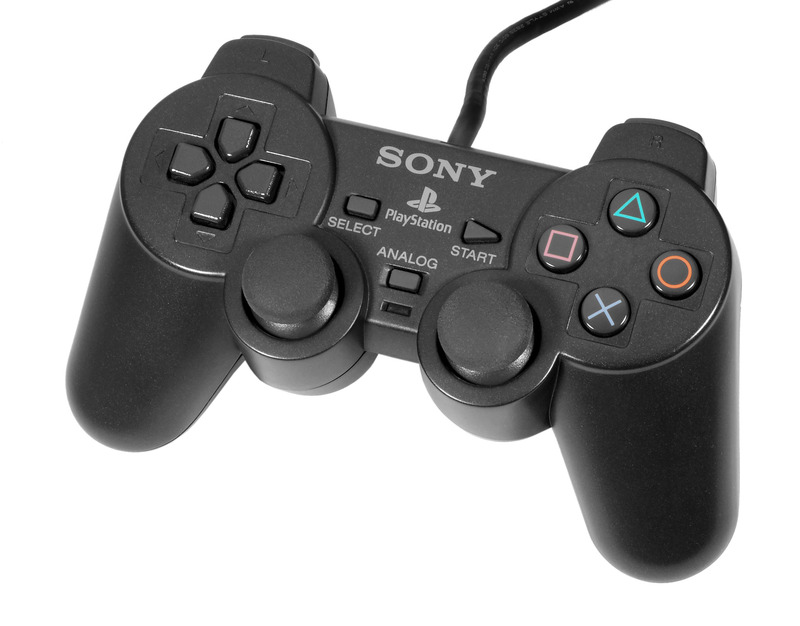 Following right after its big brother, the PS2’s name ranked 12th, controller 11th, appearance 15th, game 7th and price 15th. Just barely scraping the 13th spot after the PS2 is Nintendo’s first major console and first on this list. The NES’ name ranked 4th, controller 16th, appearance 17th, game 16th and price 7th. It’s 2 top 10 ranks over the PS2’s 1 give it the better spot. Sony’s latest console’s total score breaks the close 1 point difference cycle that seemed to develop for the last few consoles. 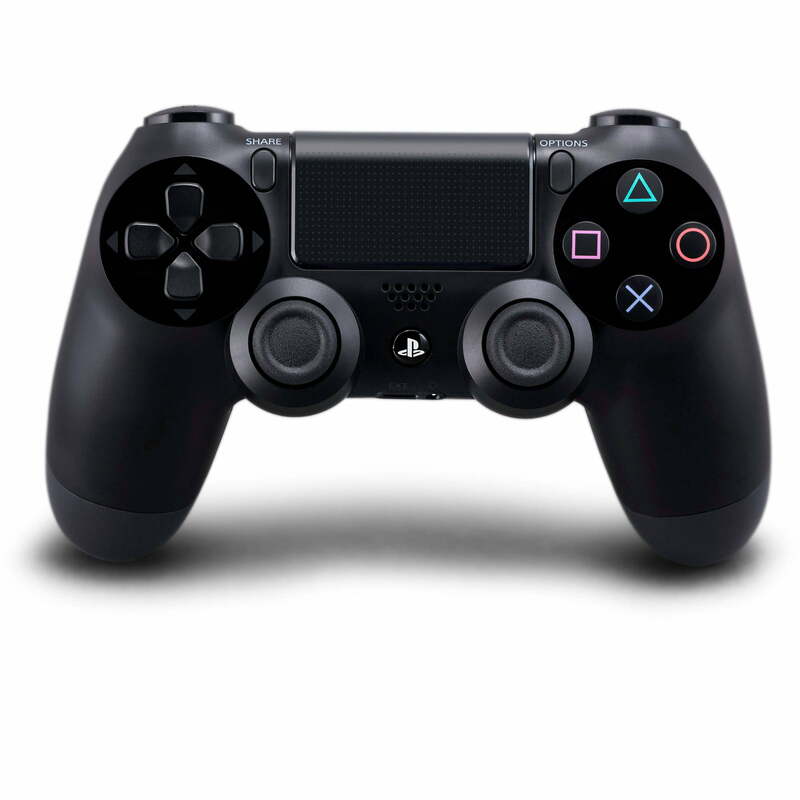 It’s name ranked 20th, controller 5th, appearance 8th, game 3rd and price 19th. The next three consoles are tied. I ranked them by most top 10 appearances. Sega’s second console is the third to appear on the list so far. It only beat the next ranked console in two wars out of the five, which is why it is the worst ranked out of the three. It’s name ranked 5th, controller 18th, appearance 12th, game 17th, and price 2nd. Sony’s third console ranks highest out of it’s four, the PS3 just beating it’s younger brother by 1 point. It’s name ranked 17th, controller 10th, appearance 1st, game 4th, and price 22nd. Nintendo’s second console is the second to appear on this list. It’s name is ranked 10th, controller 9th, appearance 19th, game 10th and price 6th. The fact that it appeared in the top 10 four out of the five wars gets it the highest rank out of the three tied consoles. 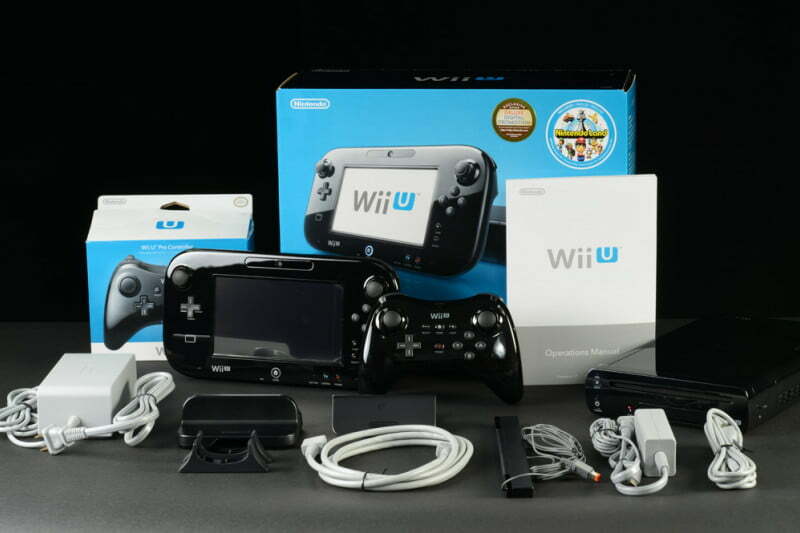 Nintendo’s soon to be replaced sixth console is the third of seven to appear on this list. It’s named ranked 22nd, controller 1st, appearance 5th, game 6th, and price 17th. Nintendo’s third console is the fourth of seven to appear. It’s name ranked 14th, controller 14th, appearance 13th, game 2nd, and price 5th. The next three consoles are again tied. I ranked them by top 10 appearances, but numbers 5 and 4 tied with those, so I ranked them by which console placed better in each of the 5 wars. Pretty darn good for a console that isn’t even out yet. This tied with the next two consoles, but had the least amount of top 10 appearances, thus the lowest rank. It’s name ranked 11th, controller 3rd, appearance 9th, game 11th, and price 13th. Microsoft’s sophomore console is the second to appear on this list. It’s name ranked 13th, controller 8th, appearance 7th, game 1st and price 18th. This console had more top 10 appearances than the Switch, but tied with the next console on the list. The 360 received a worse ranking because the next console ranked higher in 3 out of 5 of the wars. 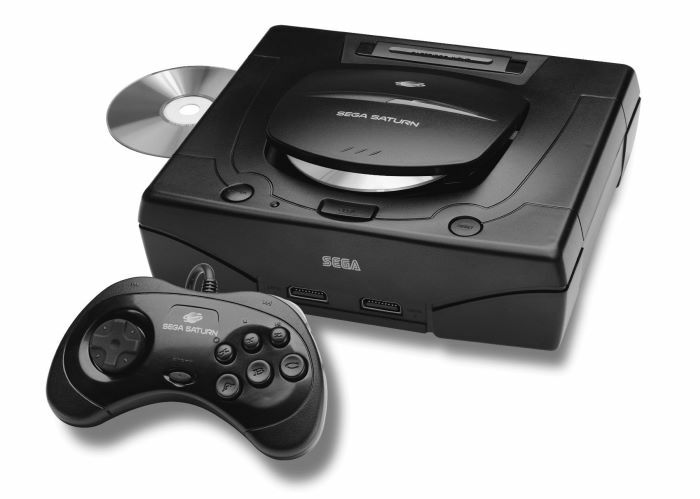 Sega’s final console was considered ahead of its time. It’s very impressive rank on this list might prove it. It’s name ranked 3rd, controller 4th, appearance 14th, game 22nd, and price 4th. It tied with Switch and 360, but had more top 10 appearances than Switch, and beat 360 in 3 out of the 5 wars. Just managing to scrape the top 3 is Microsoft’s first console. It’s name ranked 6th, controller 12th, appearance 6th, game 8th and price 14th. Nintendo’s fifth console takes the number 2 spot! It’s name ranked 18th, controller 2nd, appearance 2nd, game 12th, and price 10th. The Gamecube doesn’t just win, but it wins by a mile! It’s total score is less than half of second place. It’s name ranked 2nd, controller 6th, appearance 4th, game 5th, and price 3rd. There you have it! 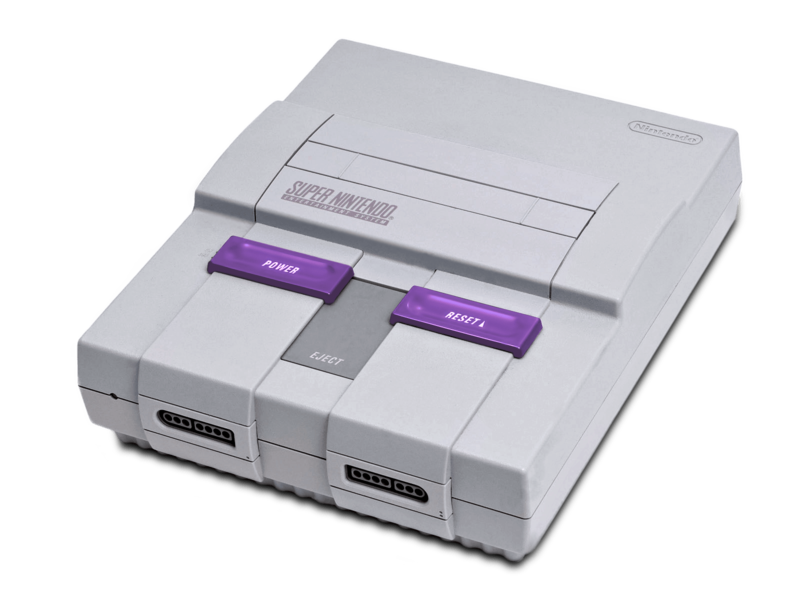 The best 22 consoles ever made have clashed 5 times, and these are the results! The true champions have emerged! For the next chapter in my Console Wars series, which can be viewed via the links here…I am going to look a little more into sales figures than I would like, though not in the normal way I suppose. Today I will be ranking the best selling game on each console by ratings, the lowest rated to the highest rated. All ratings are taken from the IGN site. Why? Because it’s the site I found that had all these games on it. I used the community rating for a broader opinion by the people who bought and played these games. In the event of a tied rating, the game with the higher sales will place at a better rank. I also am not counting any games that were included with the system, because that’s sort of cheating. That means no Super Mario Bros or Wii Sports or the like. Also, I have no idea how accurate the sales figures are I found, and the older systems are definitely shady. But that’s all fine and dandy, because at the end of the day, this is just a meaningless blog by someone who loves gaming enough to write such strange things. This war is based all on figures, my own opinion has nothing to do with any of these rankings. All ratings are out of 10. Fun fact- All Nintendo consoles are in red text, Atari in orange, Sony in black, Sega in blue, and Microsoft in green…Wowsers! This game sold 2.42 million copies, a very nice figure considering the poor sales of the Dreamcast. The game was decent for its time and Sonic’s first adventure in full 3D, but it has not aged well at all, making it rather deserving of it’s low rating. This game only sold 102,056 copies. Again, probably not bad for a very poor selling console. I personally have never played it, or even heard of it until now, though chances are I would prefer Sonic Adventure. This is sort of a made up one. It was difficult to find any actual figures, but this seemed to be a fan favorite and did fairly well nonetheless. It is usually in the top 3 best 7800 games too, so it was probably up there in sales. Everyone has played Pac Man at some point in their lives. I have played it on countless consoles, but I think the first time I ever played it was on the 2600. Good times…I think. 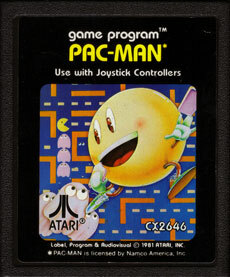 This particular version of Pac Man sold 7 million copies. This game sold 1.93 million units. I have never played it, on the Saturn or any platform, so I have nothing to comment about it. This wonderful game sold 6.03 million copies, a little lower than I thought for one of the best platforming games of all time. I truly have many wonderful memories with this one. Though this game received the same rating as Virtua Fighter 2, it’s higher sales gets this game placed one spot higher. T his is another classic game that I have not played in well over 20 years. It was a lot of fun, and 28 million other people probably think so as well, (well that’s how many people bought it anyway). It was very exciting to see the duck and dog duo again in the latest Smash Bros game too. I haven’t played a Halo game since the second, but it is no surprise this would be at the top of the Xbox best sellers list, with 5 million copies sold. This figure will likely grow much higher over time. This was a mind blowing game when it first came out, and it is still a whole lot of fun today. I would recommend it to any RPG fan. It definitely deserves its rating, though I could not find a solid figure on sales, this was always prominent in any report about the SMS games. I have never played a Jaguar, so I have never played this version of the game, but if it is the same one I played on PC, then this game absolutely deserves to be on this list. It sold 6.7 million copies, an impressive number for the Jaguar. I love this game! It is one of my favorites, if not my favorite in the whole series. With a staggering 36.83 million sales, I believe it is in the top 10 or maybe top 5 highest selling games of all time! Okay, so this is cheating since this system is not even out yet, but I simply averaged the rating of the other six consoles Nintendo has on this list and it came out to be 8.9, which sounds like a fair number for Nintendo games, if not rather low. MarioKart is always a hit seller, so I’m thinking that would be its number one selling game for sure. I also averaged the sales of all the Nintendo games on this list and came out with 16.76 million sales. That sounds very right if the Switch does well. Now we are getting into the 9’s category, and it works out perfectly for the top 10. This game hasn’t aged well, but it is still pretty fun to play. 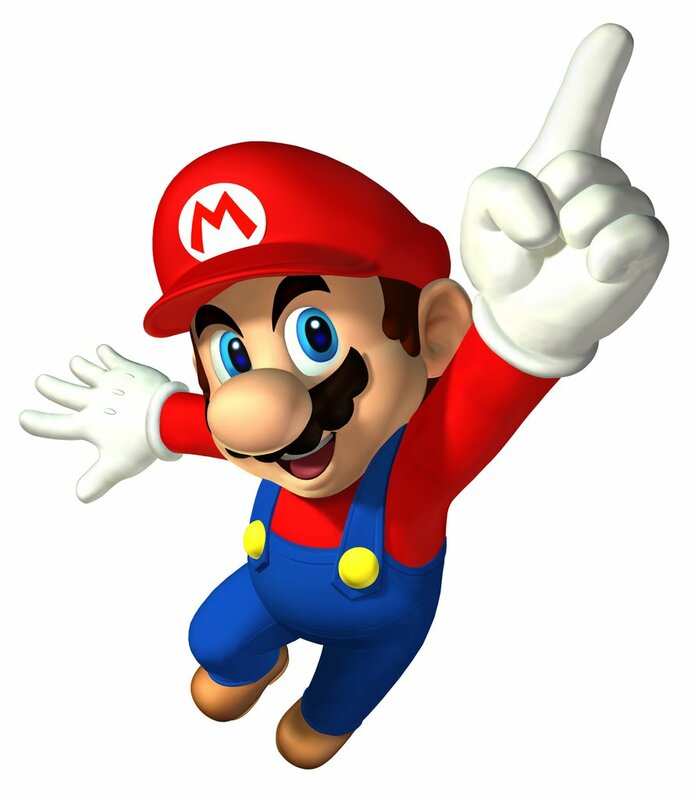 It sold 8.76 million units back in its day, and MarioKart has continued to slay sales ever since. Another 9.0 game, and another racing game. This had a very high sales figure of 11.15 million, placing it well above Super MarioKart. I have never played this game or any of its many sequels, so I have nothing to say on the matter. The sequel to the wildly popular Halo. I still remember the week leading up to this release. All the kids in school were going absolutely insane, many of them taking the day off on its release. It sold 8.43 million. This game sold a whopping 17.5 million copies. It is probably my favorite in the series. Still, I was shocked to see this at the top of the sales list. Here we have another MarioKart game, this one selling 8 million, more than half of all the Wii U owners have this game! Wow! This is a really great game, though I would rank it my third or fourth favorite in the entire racing series. 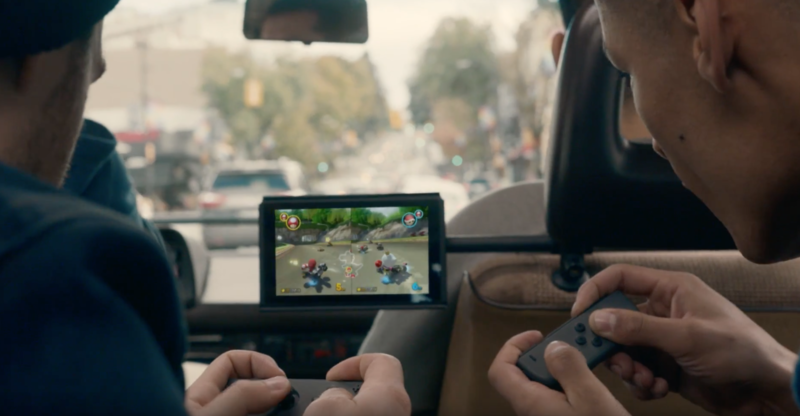 This also completely solidifies my made up MarioKart Switch game taking the top spot in sales for the upcoming system. I don’t even want to know how many hundreds of hours I spent playing this game. It is still a fun game today, though it hasn’t aged too well. For the time, it was the best game out there, especially when you had all four players going. The game sold 7.09 million. This has the same rating as Super Smash Bros Melee, but it has about triple the sales at 21.3 million! I haven’t gotten around to playing this yet, even though I own it, but I am honestly shocked that with all the great games on this console, GTA would be at the top. I haven’t gotten around to getting this game yet, though 2.7 million other people have. While I was completely underwhelmed with the first and third game in the series, I absolutely loved the second game and think this one looks amazing too. I can’t wait to play it…I am sure it will live up to it’s high rating! While this is the same rating as Uncharted 4, SM64 has sold 11.89 million copies. I am shocked this game has such a high rating. While it is still fun to play, I think it is one of the worst Mario games ever made. Though it definitely helped shape 3D gaming in a generation where so many companies were failing miserably at it. Well this is sort of anti-climatic. This game has already appeared on this list, but the 360 version has bested all. It has the same rating as the third and second spot, but its impressive 17.79 million sold copies puts this at number 1. I still can’t believe a GTA game made it this high. When I finally get around to playing it, it better be nothing short of a 10 in my book. Though apparently the 360 version is .1 point better. And there you have it! Microsoft takes it’s first number 1 spot! But to find the real winner, let’s see who had the most in the top 10! And tied with them is Sega for 0 in the top 10 as well. After them is Microsoft with two. Then interestingly enough, we have a tie for the winner. Sony and Nintendo both have four in the top 10. So to break this tie, I will take the average rating of the four titles in the top 10 from each company. Nintendo’s average is 9.3, while Sony’s is 9.2. Wow! That was a close competition for sure, but Nintendo just manages to squeak out a win! Good job to all, see you next time! I’ve already pitted the biggest companies in gaming against their names and controllers. Now it is time to do battle against the physical appearance of the consoles, in my on going “Console Wars” series to see what company did what best by looking at obscure things and not sales. So let’s find out who makes the prettiest consoles. Looks aren’t everything, but in this post, they are. Note that I am only looking at the original models that were released for each console. Fun fact- All Nintendo consoles are in red text, Atari in orange, Sony in black, Sega in blue, and Microsoft in green…Yeehaw! This is an ugly box with a bunch of switches. To be fair, it’s style sort of matched old TVs from back when this was made. But today, it is not at all visually appealing. While this is much better looking than it’s predecessor, it was still a giant hunk of ugly. I’m guessing Nintendo designed this before dropping their partnership with Sony. 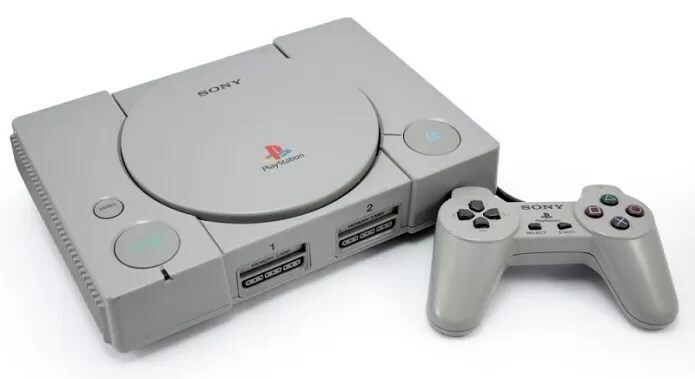 It has the same ugly grey color as Nintendo’s first two consoles. I really hate how this console looks. It just appears so cheap and meager. This is what I was talking about with PlayStation. 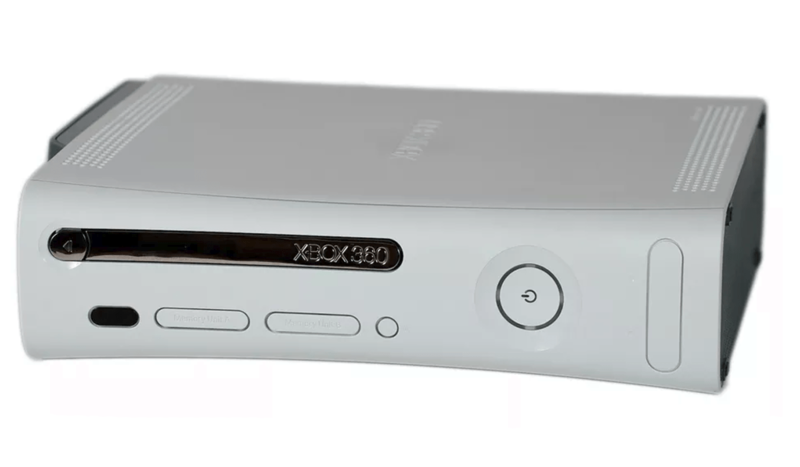 It is another ugly grey console. Though this has purple switches to break the monotony, but they somehow make it even more ugly. This is quite a simple look, yet it looks much better than any console on the list so far. It just gets its point across, while not doing anything too fancy. This is another ugly console, but it’s interesting box look and simple set up bring a strange charm to the whole thing. This is a nice, sleek black color, with a unique design. While I wouldn’t call this console exactly pretty, it still is neat looking. This console is so large and ugly. 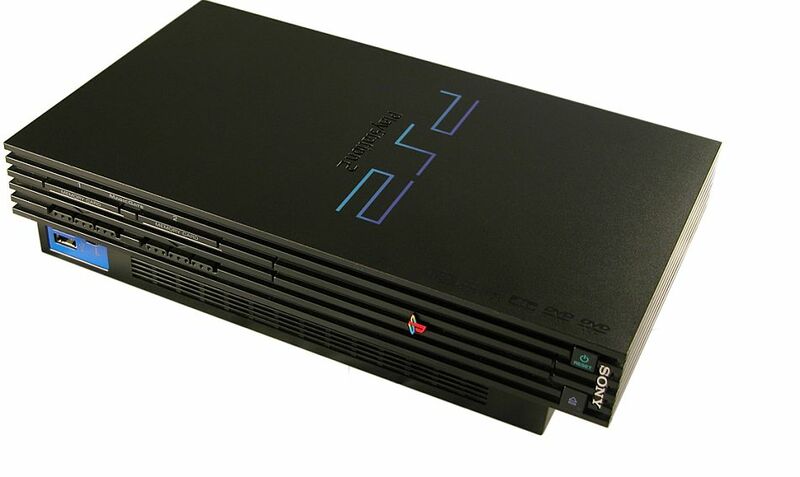 The only thing that saves it is it’s black color and the cool “PS2” coloring on top. Otherwise, it’s shape was so terrible and it took up half your living room it was so big. Did Nintendo design this too? We are back with the ugly grey, but other than that, it’s got an okay design. Finally Nintendo drops the grey color and makes this significantly better looking system. It’s shape color, button and controller layout make it simple yet pleasing. This has a nice black finish to it. It is great looking console. This takes the good old grey color and darkens it to a cool and unique shade. The shape of the console is pretty sweet too. This is just an awesome, solid black rectangular prism, and it is just amazing. I am always reminded of a boom box when I see this picture. It is no doubt a unique look, and a good one at that. Sleek black looks always seem to look better when it comes to consoles. This one is no exception. I don’t love the shiny left side/old looking right side combo though. Here is another unique looking console, and much more futuristic than anything we’ve seen so far. I just don’t love the white. This console looks awesome. 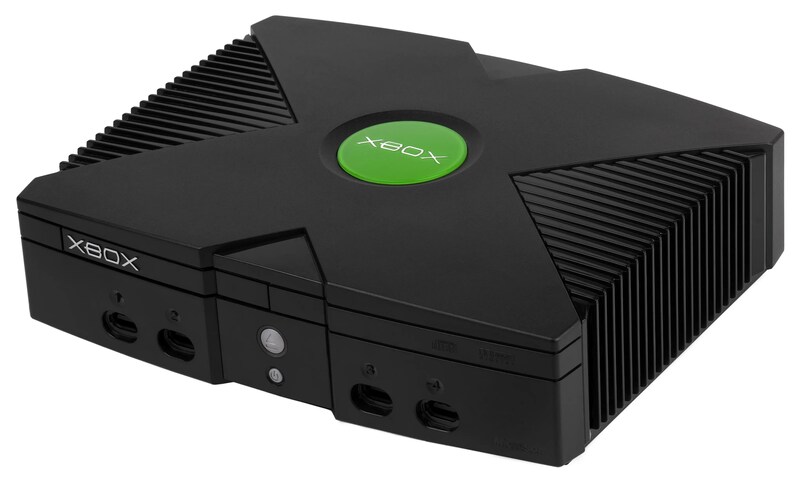 Everything about it just catches your eye and makes you say “I want to play that thing.” The Xbox is an appropriate name for it. They do it right with this console. 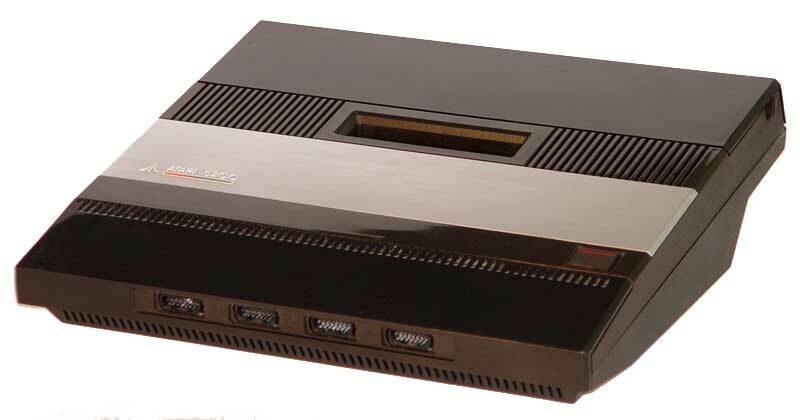 A nice, shiny black finish coupled with a nice thin console makes this one beauty of a console. It just is a bit too long for my tastes. The only thing better than a black console is an indigo one. 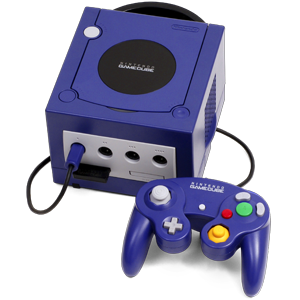 The Gamecube is just awesome looking. It’s a simple design and puts everything you need right in front of you. It even has a handle for ease of carrying! Such a great console! Though I have never seen one of these in real life, they look awesome with the contrasting “X-ish” design and black and lighter black coloring. The complete lack of buttons polishes it up a lot too. This is a gorgeous console. It’s shiny white finish paired with it’s tiny body make this a sweet looking console, especially when that blue light flashes on it. And here we have the best looking console ever made! This picture does not do it justice however. 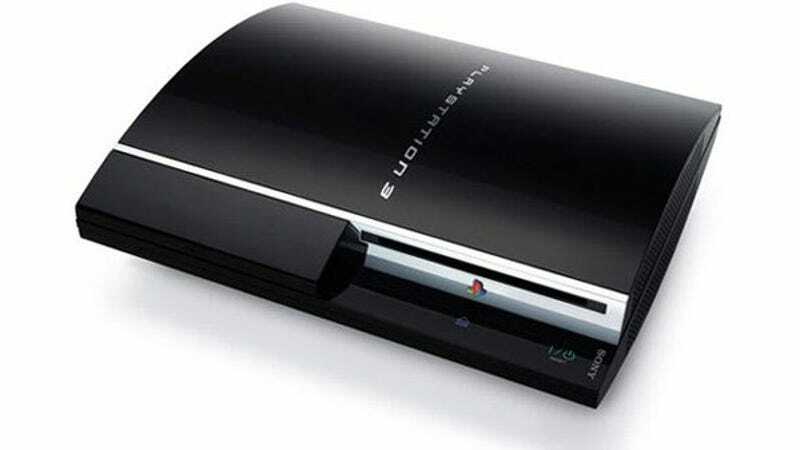 The original PS3 was just a beautiful shiny black surface with a disk drive. Whether you stood it up or laid it down, it looked great. The only downside to this console was it’s rather large size. And there they all are, ranked from worst to best. Sony takes its second first place finish, which is fabulous, but as before, the real winner is the company with the most in the top 10. 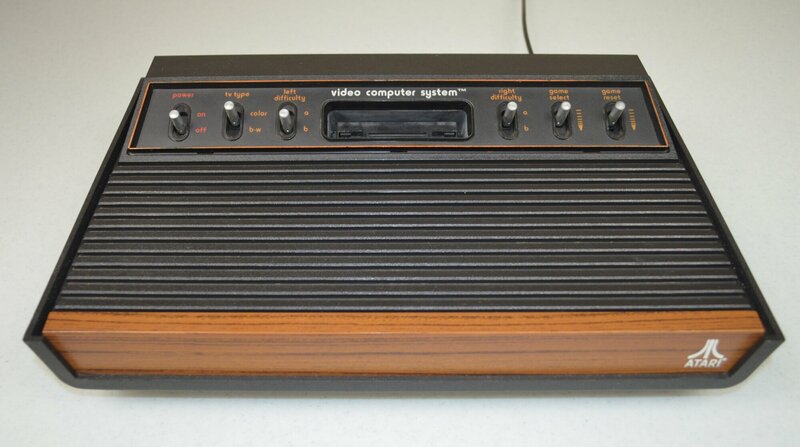 In last place we have Atari with 0 consoles in the top 10…better luck next time! 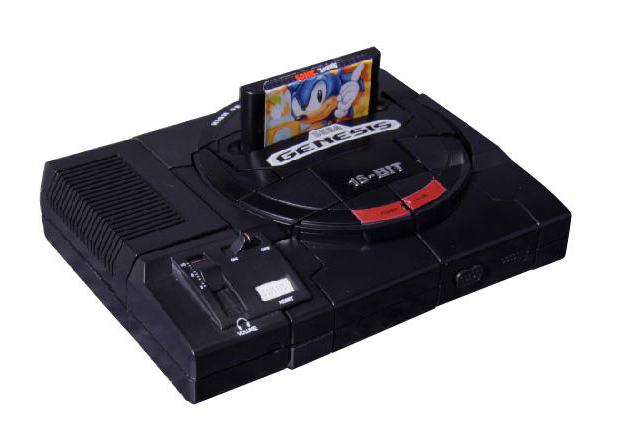 Sega comes in fourth with one console! Sony takes third with two! Microsoft takes second place with three consoles! That’s right, all three of Microsoft’s consoles made it into the top 7! That is an honorable feat! But taking first, we have Nintendo scraping out a win with four consoles, making it their second victory in the console wars! Continuing on with what I guess is now a mini-series of the Console Wars, but focusing on different areas than normal. I am using only the biggest names in gaming history, and most of their consoles, creating a big all out war, instead of just one generation. Last week the consoles battled it out for best names. This time we will see which consoles had the best controllers. As always, they will be ranked from worst to best in my opinion, and I am only judging based on the controller that comes packaged with the original system. Here we go!!! Fun fact- All Nintendo consoles are in red text, Atari in orange, Sony in black, Sega in blue, and Microsoft in green…Smashing! 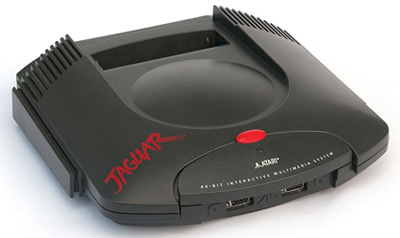 Take note, I have never played a Jaguar or held the controller. Just look at this thing. It’s got three oddly placed red buttons that make it seem like you have to lay three fingers flat on the controller to play it effectively, the two middle buttons (pause and options) are just crammed in there, consistent with the whole flat palm playing. The D-pad is just like every other controller, so there’s a win. But what really blows my mind is this large hunk of junk attached to the bottom of the controller. Look at all those number buttons!! What am I supposed to do with those!? Is it so you can play the games from older systems that used numbers? Yikes! What a mess! The whole thing looks uncomfortable and awkward. Note that I have never used this controller before or held it, or even have seen it in real life. It’s pretty sad when this thing isn’t at the lowest spot. I mean, how do you regress from this? It’s like the world’s first cell phone with a joystick attached to where you would hold it up to your ear. I mean damn…what would you play on this thing? I actually have seen it in action. There are cards you put over the number pad for specific games, thus the cards instruct you what each number does, but that sounds horrible and stupid. They should have just cut off the numbers and use the joystick with the two red side buttons. Note that I wasn’t sure which was the original, but I’m going to guess the one on the left. I have never played a 7800 or used these controllers. Either one, they are both pretty bad. Well, the left one is definitely a huge step up from the 5200, and looks like it would play Atari games quite well, it just looks like it would be awkward and uncomfortable to use. The one on the right is like the beginning stage of the Jaguar. It even confirms my suspicions on having to play with your hand flat on the controller, as evidenced by the neato finger indentations. There’s a weird joystick/d-pad hybrid that looks like it would fail to justly perform as either. And here we are with yet another Atari controller. 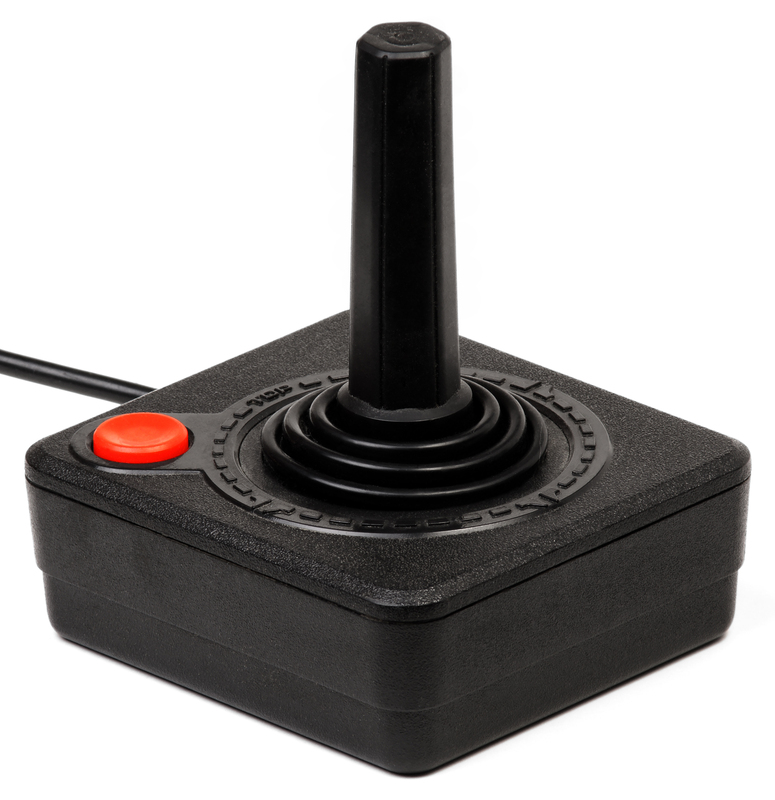 They are sort of at a disadvantage due to the time period that Atari was popular, where you didn’t need much to a controller, and they basically had the task of inventing controllers for home consoles that played multiple games. 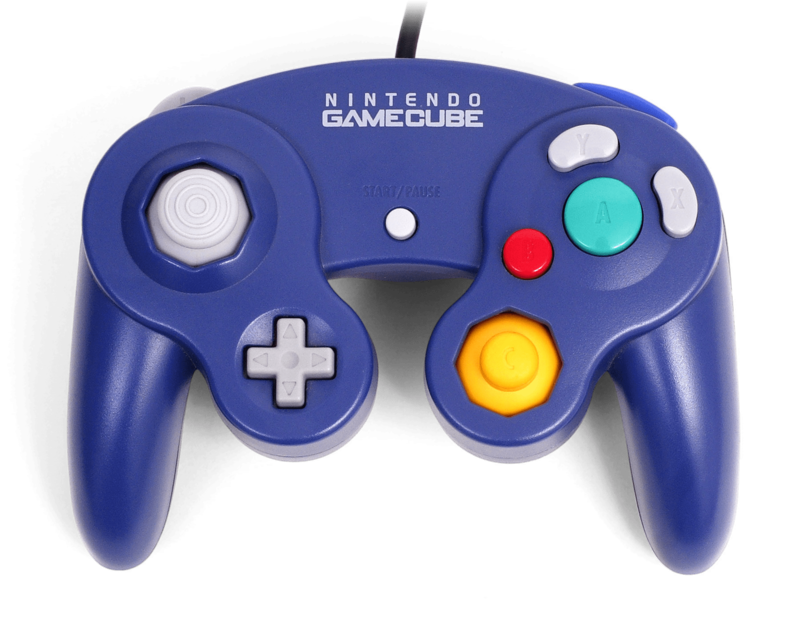 That being said, they still could have done a better job, though this is their best controller by far. 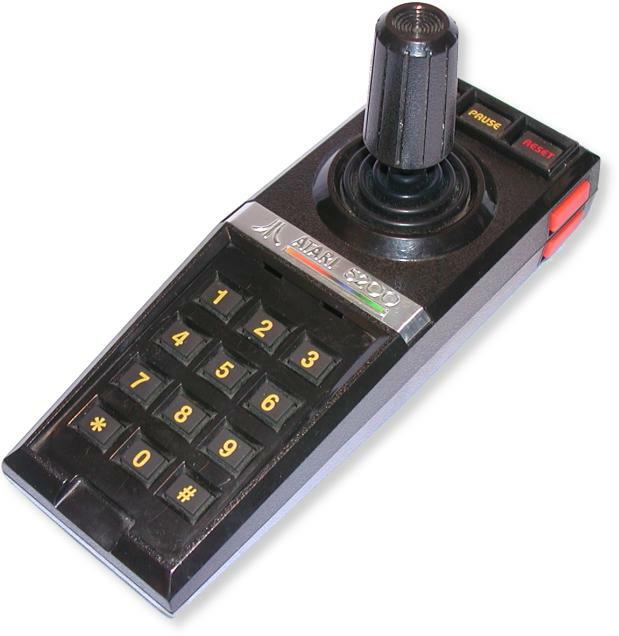 A simple button and a joystick is all you need to play 2600 games and it worked fairly well, though it got fairly uncomfortable to play after a while. This controller had a flawless D-pad and was comfortable to hold. The only problem I had with this controller was the three right buttons. Having them lined up made some games awkward and hard to play, because you really couldn’t hit more than one at a time. This is almost okay though, because most games only required the use of one button. In some games all three buttons did the same thing, while other games the B and C buttons did very minor things. When compared to it’s competition, this controller was terrible. This controller had a pretty unique D-pad for the time, though it always wasn’t very precise. I loved how you simply had buttons 1 and 2. It was easy to hold and easy to play with, much more so than it’s successor. 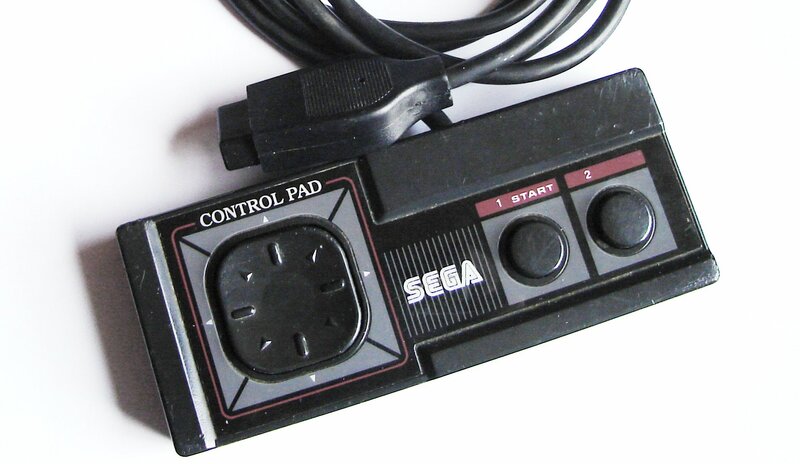 This controller is nearly identical to it’s SMS competition. What makes this one better though is the inclusion of start and select buttons and a more pronounced and accurate D-pad. The best way to describe this controller is bony. I guess because it’s a grey-white color and thin. It is a comfortable controller and the first controller to introduce 2 buttons on each shoulder. The D-Pad was also made into four separate buttons instead of actually being a…well…pad. This had its advantages and disadvantages. This was the first console to introduce button names with shapes rather than numbers or letters, though I never really liked the D-pad style layout of said buttons, though it is still comfortable and easy to play. This is a weird looking controller, filled with a ton of buttons. At the time of it’s release, it was easily the most comfortable controller ever made. But I never really liked the layout all that much. 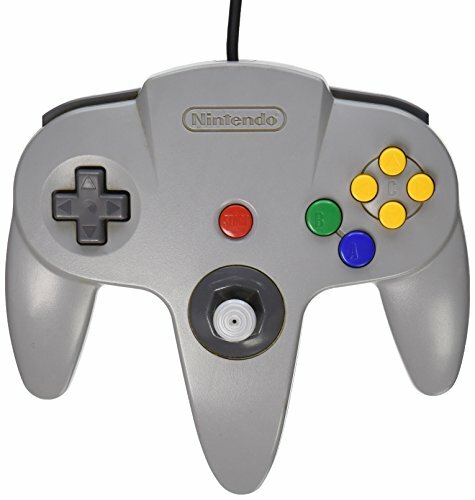 The C buttons always seemed out of reach with the exception of down-c, and if you held the controller by the center…prong?…the D-pad and L-button were useless. Though the Z button hiding in the back basically replaced L. What was cool about the controller is you could hold it from each edge and use the D-pad instead of the joystick, but I don’t recall ever playing a game that required you to play like that, so the whole controller seemed bigger than it needed to be. I have only played a Saturn once, like 20 years ago or so, so I don’t recall how it feels to hold it, but it looks comfortable enough. 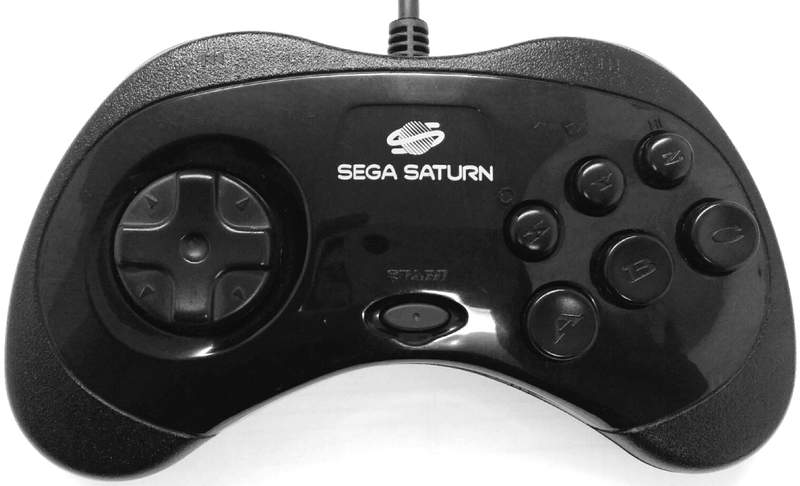 It is basically just an updated version of the Genesis controller, featuring a slimmer look and more buttons.They are laid out slightly more angular this time around, so it looks like you could hit two buttons at once if you needed to. Though it still looks like you would never use the X, Y, Z buttons. 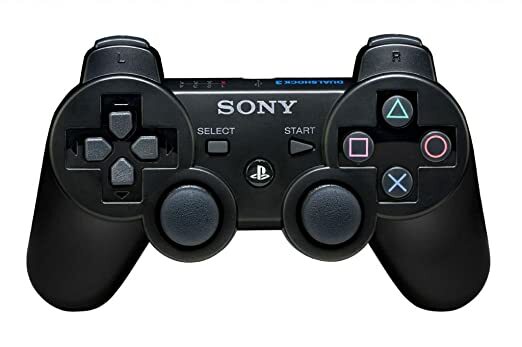 This is exactly like the first PlayStation controller, but black and has an analog button that never did anything and two more than welcome analog sticks. It still wasn’t the most comfortable controller, but it got the job done. Sony being as creative as ever, this controller is basically the same as the PS2’s, except it has a “home” button that actually does something and the L2 and R2 buttons are more like triggers. I hated that change at first, but I grew to love it, so that I can’t stand playing with a PS2 controller now. Oh yeah, this one is wireless, and is charged by plugging it into the system. Awesome. I think the controller is slightly slimmer and reformed to make it a bit more comfortable as well. Oh and I almost forgot! This has motion controls added that were only really utilized in the very early PS3 games. This controller took the world by storm with it’s many buttons. In addition to the A and B buttons from the NES, they are joined by X and Y. I always wondered why it wasn’t C and D. But one day I noticed…A, B, X, Y. They are all the same letters as all the fighter ships in the original Star Wars trilogy. A Wing, B Wing, etc…Was Nintendo giving a nod to this mighty franchise? Anyway, we were also given shoulder buttons for the first time, which was a nice addition. The layout of the A-Y buttons allowed you to comfortably and easily press two at a time, and three if you threw in another finger, or bent your index the right way. Anyone who played the Mega Man X series and constantly held down the charge button (Y) and always used dash to move (A) all the while jumping (B) knows what I’m talking about. It was a relatively comfortable controller, but it seemed a bit frail. It certainly blew away the Genesis controller in their rivalry. 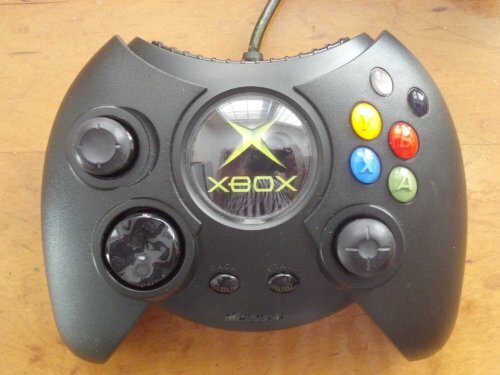 This is the original Xbox controller on a diet. 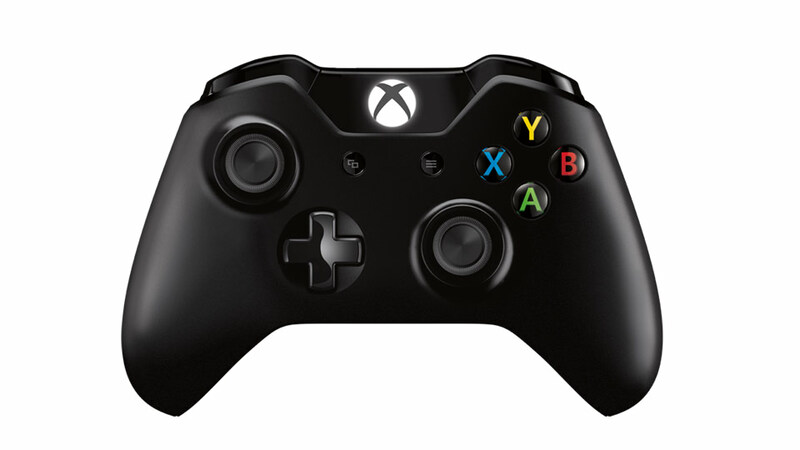 Microsoft trimmed down all the hugely unnecessary fluff and came out with a great controller. All the buttons are close and easy to reach, it fits nicely in your hand, and it was the first wireless controller to come packaged with a console. I have never played or even seen an Xbox One, but this controller just looks like it took everything that made the 360 controller great and improved slightly on it. The analogs look perfect, as does the D-pad. Everything is placed quite wonderfully, not to mention it is a gorgeous controller that looks very comfortable. This is without a doubt the most famous controller in history, for it is still in production two console generations after its own. That’s how strong its popularity is. It is, in my opinion, the most comfortable controller ever made. Your hand just seems to fold around it. The L and R buttons are indented so that your fingers like melt into them. Everything is easy to reach, and it’s very easy to multi-task due to the layout of the buttons. But comfort isn’t everything, so that is why I have this wonderful controller at number 6. This is a weird controller. It feels more comfortable than the rest in the PlayStation family, yet at the same time, more uncomfortable. The analog sticks give you more grip, but they feel so unnatural and different. The D-Pad and right shape buttons are easier to press and seem smaller for some reason. The shoulder buttons are different once again, sort of a hybrid between PS2 and PS3’s shoulders. Overall, it’s not my favorite controller at all, but the trackpad innovation sets it apart from most of the other controllers. I haven’t spent too much time on my PS4, but some games make somewhat clever use of it. In any case, it is strangely satisfying to swipe your finger across it, even if it’s only to flick a switch or something in a game. This too has motion controls, that have been used cleverly in games such as Infamous: Second Son. 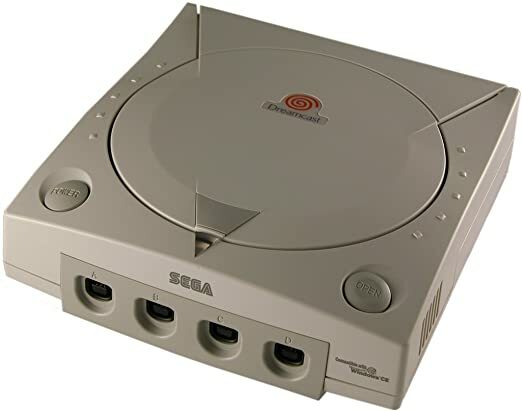 The Dreamcast was a very advanced console, and that includes it’s controller. It wasn’t the most comfortable controller, and it didn’t have too many buttons, though there are some shoulders hiding. 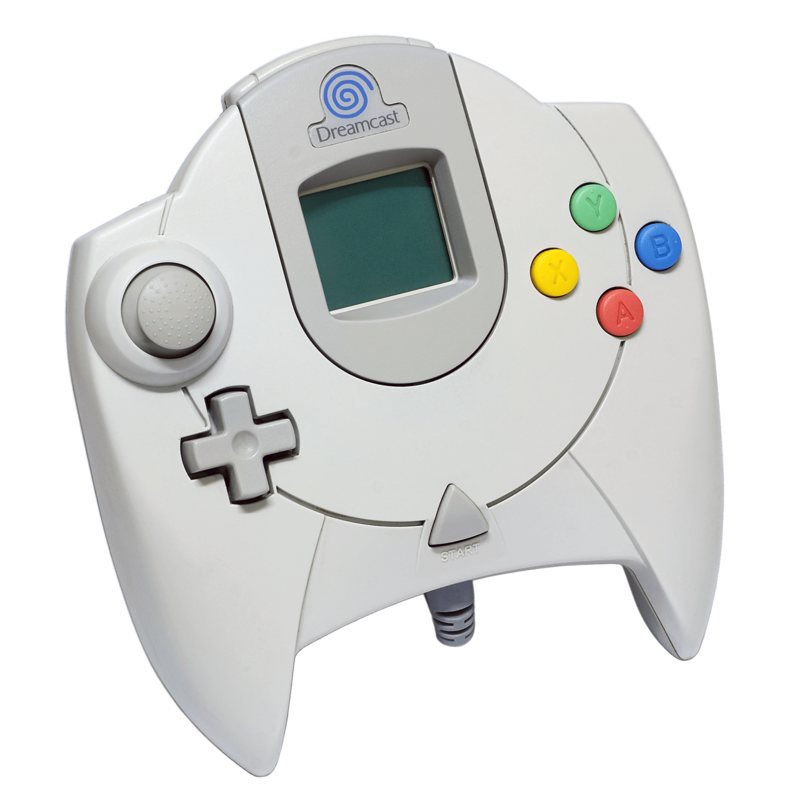 But this controller was crazy, though honestly I haven’t played a Dreamcast in a very long time and never really fully understood what it did. 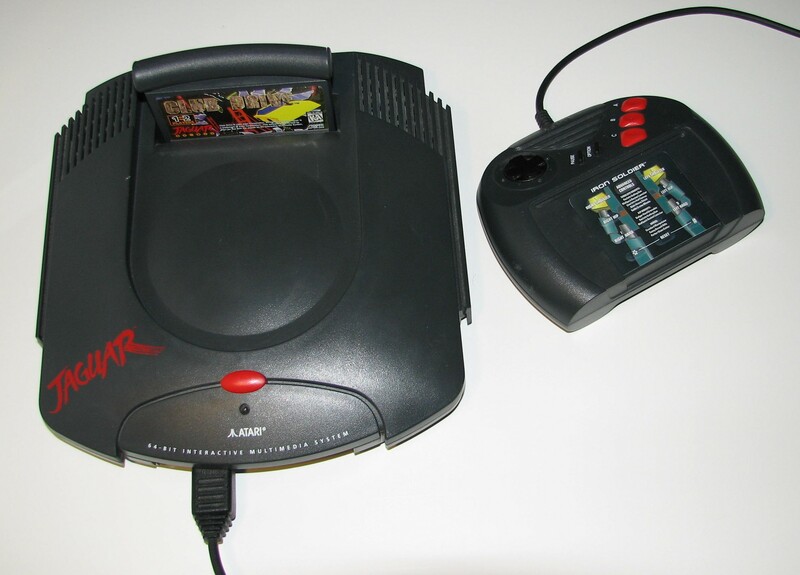 It had a screen that did nothing in any game I played, but you could plug something into its back and it did all sorts of things that consoles would not start doing for another whole generation. It was a unique and interesting controller, but I couldn’t understand it, and neither could anyone else. That is why it failed. This thing is crazy. Obviously this isn’t even out yet, so I can’t say much on how comfortable it is, though it doesn’t look all that pleasing to the hand (at least the left picture anyway). Though Nintendo always makes shockingly comfortable controllers so I am not worried. The amazing thing about this controller is you can remove the left and right lighter grey pieces from the picture on the left, and then use each segment as a controller on its own for multiplayer, or slide them onto the screen as pictured on the right to take your game on the go, or even set that nifty little screen on the stand built into the back and use the two controller segments without attaching them to anything. . It’s so clever I could poop. This was another clever and extremely comfortable controller by Nintendo. 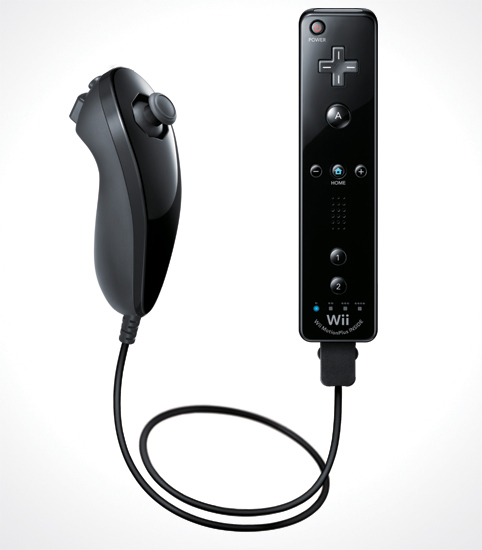 Some games you just used the Wii Remote, (right device) for motion controller primary gaming. Other games had you using the remote held on its side, so it was sort of like playing an advanced NES controller. Finally, you could plug the nunchuk, (left device) into the bottom of the remote for more advanced play. The nunchuk adds a few more buttons and is also able to use motion controls. To makes thing even better, again your hand seemed to naturally mold into the controller, making it almost pleasing to hold. It was definitely a unique set up that allowed for truly unique gaming. And here we have it, the best controller ever made. Despite it’s large size, it is really quite comfortable, and features an abundance of buttons. It has a microphone that has various functions, even some in-game ones. That weird rectangle in the left is some scanner for amiibo, and best of all is the TV button, which basically turns your controller into a remote control for your TV, which is honestly one of the best things that’s ever happened to a controller. The best thing about this controller is the big screen in the middle. It is a touchpad, which adds some fun to games, and also makes it very easy to use the system’s other various applications. But best of all, the screen meant that there were now two screens for the game to use instead of 1. The possibilities for games just lifted to a whole new level. For the first few games, it was truly awesome some of the things they were using the gamepad for, but popularity for the system never took off, and developers didn’t want to spend extra resources developing for a system that wouldn’t sell their games, so many games just used it to mirror what was on your TV screen. I was devastated. This controller has so much potential, and gamers and developers alike failed to realize that. The other great thing about the screen is you could play your games off the TV. So when my wife wants to watch something stupid, I can just switch the game to the gamepad and play there. It was truly a great idea. And with that, Nintendo takes the top spot! But as I did with the Console Wars: Names, I feel the company with the most consoles in the top 10 is the true winner. Sega is in fourth with 1! Microsoft and Sony tie for runner up with 2 each. That leaves Nintendo with a whopping 5 controllers in the top 10. They even hold the top 3! Nintendo is clearly the best, and certainly most unique/creative controller makers! Today I just want to talk about Windows 10, or rather, warn people to stay away from it! I was happily using Windows 7 since I built my computer about 4 or 5 years ago. But ever since Windows 10 came out with its limited time free download, which ends July 29th by the way, every day some pop up telling me to get it annoyed me. After months, I finally got fed up with it. I saw that it was possible to revert back to your old operating system if you did not like it, and it was free, so what did I have to lose. So here it what happened. The user interface is completely changed from Windows 7, but that is to be expected, though it is a lot harder to find things, making everything needlessly condensed and impossible to find. Windows 10 claimed it was faster, which at first was true, but ever since getting it, my computer has been slowing down day by day, occasionally, like this morning, being impossible to use. Other infuriating differences are that now every other time I turn my computer on, it does not connect to the internet, and tells me to install my Netgear device, even though its plugged into the back and installed. Never had an issue with this until Windows 10. So to fix it I have to restart the computer, then it works. The next time I turn my computer on it will succeed in connecting, but the next time it will not. And so I am stuck in this abysmal pattern. Another thing that has gone horribly wrong with since “upgrading” to Windows 10 is that every time the computer goes to sleep either manually or on its on, when you try to wake it up, my tower lights up and starts to booot up, but then it shuts off. However my keyboard and mouse light up and will stay lit up forever if I never turned my computer back on again. Once I press the button, the computer starts up just the way I left it before it fell asleep. The final unbelievably annoying thing about Windows 10 is the seemingly mandatory password screen when you start the computer. I’ve searched and searched through the computer, messing around with all the settings, but I can not seem to find a way to turn this off and just have the computer boot up without inputting a password. I have been too lazy to google if there is a way, but my point is, it should not be so cryptic, that after 2 hours of looking, I can not find a way to stop it. So naturally, after hating every time I’ve used my computer since getting Windows 10, I have been wanting to revert back to Windows 7. I found out how to do it, but never had the time or thought to do it. I finally did the other day, but that option to revert with everything in tact was no longer there. I was furious. So I looked up what happened, and it would seem you have only one month to revert. Nothing ever gave me a heads up about this, and now the only way to get back to Windows 7 is to reinstall it with the disc, which probably means I will have to reinstall all my apps and files and what not again, and that is just not worth it. If you have Windows 8, they say this is a good upgrade. If you have Windows 7, I would recommend getting it before July 29th for free, and then IMMEDIATELY reverting back to 7. You will always have Windows 10 after “upgrading” even though it’s free, so you can move back up to Windows 10 for free any time you want, though right now there is no reason to. Well, another e3 has came and went. Overall I thought this one, like last years was disappointing, though there were a few new games that caught my interest, though definitely a record low for e3. There was also some nice gameplay shown for a few previously announced games, like The Legend of Zelda: Breath of the Wild and Friday the 13th, the Game. But this post will be focused on all the new games announced this year, so here goes. First off is Kojima’s first game since leaving Konami, called Death Stranding. There is a lot of buzz about this game on the internet, and frankly I don’t know why. The reveal trailer is highly uninformative of anything and looks stupid. Though they could have revealed more about the game other than the trailer by now, but I have no interest in looking into it. Crash Bandicoot 1-3 are getting remasters.I’m kind of annoyed by this, as I just played through these games via PlayStation Store like 2 weeks ago, after purchasing them about a year ago. This is great for fans of the series who have been wanting to revisit these old classics, but I for one have no interest in looking into this remaster further. Plus, I’m just so sick of every game being remastered these days. Spider-Man Ps4 is next, and though only a short gameplay trailer was shown, it looks fantastic. This is one of the few games announced this year that have caught my interest. I love the Amazing Spider-Man games that have come out in the last few years, and this looks like it builds upon that system. I can not wait, especially since it is not tied to a movie counterpart, thus free to do anything it wants within the Spider-Man universe. Really can’t wait for this one. Days Gone is another game revealed that I thought looked really good. Sony showcased a short demo, and it was just some poor guy relentlessly getting chased by hordes of zombies while doing his best to kill them and/or escape them. Looks like a lot of fun..
Another one I am interested in is Resident Evil 7, but not by the trailer which was shown, but simply because I am a huge fan of the franchise. The trailer itself depicts the game as being your run of the mill, first person survival horror that developers seem to constantly be pushing out these days. So far it seems like all you have is a flashlight and your wits to sneak around a mansion presumably filled with zombies. It’s a change for the series yet again, so it welcome to me, though it is not the direction I would have liked the series to go in. It will also be available for PS VR, the first game that I found myself actually wanting to use a headset for. A new Batman Arkham game was announced for PS VR too, nothing exciting looking about it. Final Fantasy XV will also be available in VR. Why? And to top off the VR sections, the steam VR HTC Vive will be getting Fallout 4 and the recently released Doom, two games that might be interesting . A reboot of God Of War was presented with an almost 10 minute gameplay trailer. This takes place within Norse mythology and his son is still alive, though he will probably die at some point, sending Kratos on his quest to kill a bunch of gods, or his son will become the god of war he must destroy. Who knows? The game looks very different from every other game in the franchise, as it probably should, having a completely different setting and story, but it looks worse. The boos fight shown was underwhelming at best, and the combat took a few steps backwards, reminding me more of your typical slow combat like Dark Souls or Elder Scrolls, instead of the fast paced, brutal action that has kept fans of GoW keep coming back for more. Overall, I was disappointed by this game, but I will be getting it only because I love the franchise, just like RE7. Trials of the Blood Dragon, a combination of Trials Fusion and Blood Dragon was announced. I don’t know anything about either of those games, so I couldn’t tell you much about what this game has to offer. It didn’t catch my interest though. Looked like some dirt bike stunt game. Grow Up, sequel to Grow Home was announced. If you like the first one, you’ll like this. Just Dance 2017 for all platforms, no surprises there. Steep. This game looks kind of dumb. You ski or snowboard or hang glide and the like while doing crazy tricks to show off to your friends. Big social focus point on this game. Not my cup of tea. State of Decay 2 will be coming out next year. If you liked the first one, then I recommend this. I thought the first one was just okay, so I’m still on the fence about this one. Dead Rising 4 looks like a hoot. It’s what you would expect from a game in this series. But man, it feels like the third one just came out. How time flies! Forza Horizon 3 is coming out for all you car lovers. A card game from the Witcher 3 is getting a separate release. People love their virtual cards these days. Indie game Fe revealed. Little monster runs around and kills other monsters. FIFA 17 for all you soccer folks. Oddly enough, this has a story mode, which makes it stand out from the other 30 games in the series. Following that is Madden 17. Do people still buy these games? Prey, a strange, first person shooter/ psycho-thriller announced. Looks pretty good. This is added to my wish list, the last that I found interesting among all of these new games. Oh boy, yet another online shooter…Quake Champions. It looks pretty good, but you know…it’s an online shooter. Skyrim: Special Edition. Woohoo, another barely aged game getting a remaster. Nothing much changes at all from the original. And that’s all the new games announced. I’m looking forward to only four of them, a record low since I have been following e3.